Over the years, a number of questions have been asked about Hive 53. Mainly artsy stuff about worktime and materials but also other questions. Below you can find a list of the most frequently asked questions. 1. How long does it take to do one comic page? Depending on the complexity of the page and the number of panels, 8 to 10 hours average, sketching not included. It takes about 2 to 3 hours to draw the page, cleanly, then another hour or so to ink the linart, so colouring is taking up the most time. I start with a very rough pencil thumbnail about the size of a post-it. When I’m sure the panelling is working out, I make the original-size page, starting again with pencils going from rough sketch to finer and finer lines until I have something that can be scanned and inked digitally – or traditionally depending on how much computer time I can spare for it. I colour digitally in Photshop CS3 using a Wacom Intuous 3 tablet. 3. Do you have more chapters in store? Yep. Around seven chapters are written down so far, and more ideas are added to them successively as I get them. 4. Will there be more to see of the Lanteans? They will feature in at least two more chapters. 5. Do you sell copies of it? No, I won’t sell copies of it because of the copyright issues. 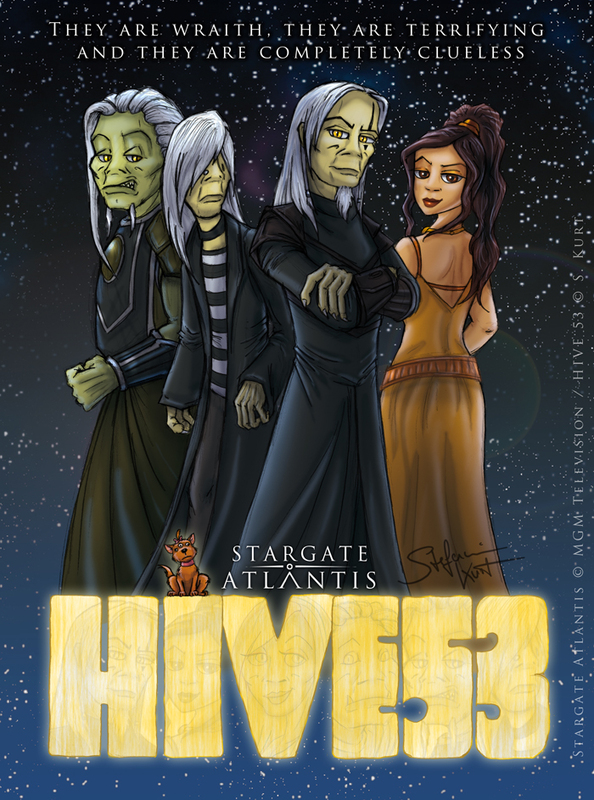 Publishing Hive 53 could only happen with approval of the copyright owner of Stargate, namely MGM. Hive 53 is a strictly non-commercial project and meant to be freely available for everyone on the internet to enjoy. Therefore I heartily discourage anyone from stealing my artwork and trying to make money from it. Feel free to share links to my comic, post pages on your blog, Facebook, whatever but please respect my wishes and credit me – and refrain from printing it to sell it. I don’t get any money from it and neither should anyone else. The only way this would ever change is, if a publishing house would be willing to publish Hive 53 with MGM’s agreement. But this has a snowball’s chance in hell to happen and besides, it would probably be restrictive towards storyboarding which doesn’t quite agree with Tox’s idea of freedom. 6. Was Tox born on Hive 53, and are the crew members related to each other? No, Hive 53 isn’t his birth hive. He has been a nomad for most of his life and seen many different hives over the time. In most cases he got kicked out because he messed up something important, or his ideas of free love weren’t shared by the respective queen. When he was a teenager, his mother sent him to another hive to be educated together with other Wraith kids. This is when he met Skin. When Tox was old enough to feed and his *ahem* interest in females had fully developed, he made a very dumb mistake by seducing the daughter of his patron. He was forced to leave the hive in a very hasty and undignified manner, dragging Skin along more or less by accident in the process. What followed was a chaotic journey through all kinds of hives, involving all kinds of embarrassment, worshippers and Tox’s ambition to spread his DNA around the galaxy. Until he finally ran across Silla who happened to need a commander for her ship right then. If anything, Tox isn’t dumb and knows to escape and hide from angry hives so he was the right one for the job. Hive 53 itself is a more-or-less-safe haven for all kinds of outcast Wraith who are either too dim or too eccentric to fit into normal Wraith society.